Houston Griffith was one of the top rated recruits signed by Notre Dame in the 2018 cycle and it was clear right away that he was going to see the field as a freshman. He did end up playing quite a bit at the nickel position last season, but that was his third position since he arrived on campus last January. 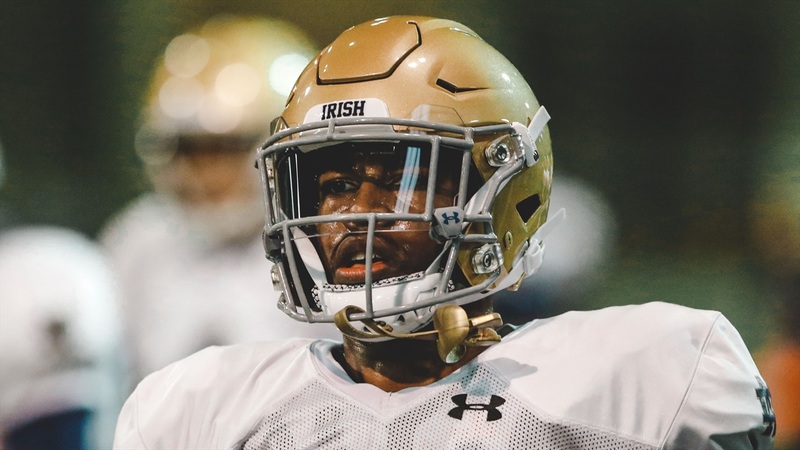 He started out as a boundary cornerback, moved to safety by the end of last spring, and then when Shaun Crawford was lost for the season, Griffith was moved inside to the nickel. It wasn’t exactly an ideal situation for a freshman to be moved around that much in year one at Notre Dame. Now the coaching staff has moved him right back to where he started playing the boundary corner spot that was previously played by Julian Love. It was a move that Griffith welcomed when they approached him about before spring ball. His confidence is one reason why Griffith is suited for the role. Even when he gives up a play, he has short memory and goes out to win the next rep. He’s not someone who is going to back down from a challenge and he’s been very vocal on the field this spring. That personality comes out every day in his constant battles with wide receiver Chase Claypool after he moved over to the boundary receiver spot. The two of them are trying to consistently push each other and Griffith relishes the chance to compete with a great receiver every day in practice. Griffith is doing his best to challenge Claypool while adjusting to playing boundary. Last year was a far greater adjustment, though. Although Griffith played and practiced against strong competition at IMG Academy, it was a completely different situation when moving up to play college football. It’s something that came up frequently in Griffith’s answers to many questions posed by the media scrum after last Saturday’s practice. He is trying to focus on the finer details of the position to help him translate his athleticism to production playing the boundary. The process has been enjoyable for him and it doesn’t hurt that there is more physicality involved at the boundary as opposed to the nickel. The player he is replacing made a ton of those physical plays over the last two seasons. Griffith has big shoes to fill, but no one should expect him to back down from the challenge.